Virgin Coconut Oil is so great , you just have to learn to make your own! Virgin Coconut Oil is so great , you just have to learn to make your own!. I’m going to talk about a product that is ‘Au naturel’ and most useful in our everyday life and hair grooming, The COCONUT OIL. Now we all know is that coconut oil is good for you, Period, That’s undisputable…. but how so? Well, apart from its exotic culinary uses, virgin Coconut oil is known to be good to your facial skin, body , it even helps with weight loss. Plus because of its high saturated fat content Coconut oil is slow to oxidize and, therefore resistant to rancidification, meaning it has a long shelf life of up to 2 years! Virgin coconut oil is recognized as one of the best kept secrets responsible for the long healthy hair in Indian women #Fact! Be rest assured that the benefits of this amazing oil is worth the effort put in making it.I have been on several escapades with this amazing oil, personally, and even though l says so, it’s no mean feat. Patience is key. There are three known methods of extracting the oil; The Wet –milling method, Boiling method and Cold pressing Method. I‘ve tried all except the cold press (which is in fact meant for larger quantities), but prefer the wet milling process, any day anytime, because the oil practically comes out as is in the fruit, boiling kind of takes out that advantage, more so, wet milling is as close as you can get to cold pressing, which is why i recommend it. Both methods (Wet milling /Cold pressing) ensure that minimal heat is used in production of that quality Coconut oil you need for your hair, face and body. .
4) and a blender/ food processor for crushing. Step 1: Simply grate your coconuts (after taking it out from its shell), if you do not have a grater then you have to slice into small pieces (this takes more time though). When you have grated the meat share into 3parts measuring with your eyes , then toss the first into a blender or food processor adding a little water enough to help it move ( two or 3 twirls is enough) .. Do the same for remaining two parts. Step 2) Pour out the contents as you blend into a neat bowl (it will look bit milky /watery ), when you are done, Take out your cheese cloth/handkerchief, Place it over the bowl with a lead and pour in the blended coconut ( again in small parts) hold the ends of the cloth together and squeeze the milky juice into the bowl , squeeze as hard as you can to get all the milky juice out , leave the empty shafts in another bowl ( if you like) , I usually throw mine in the bin. For the purpose of demonstration I’ve randomly chosen photos from google. When you are done, this is how it will look. 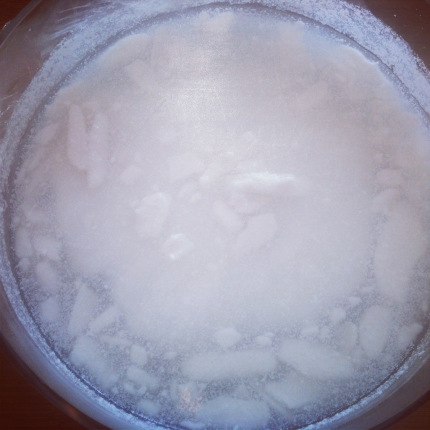 Keep in a cool or dark place for about 5 – 6 hours; you will notice that the water and the milk have separated in the bowl looking like the pics above. Your coconut oil can be found at the top layer so don’t be discouraged, it is mixed with the curd , but not so easy to spot right now hence it has to go into the fridge for another 2/3 hours for solidification. This is what it will look like when it gets out. Now pretty, scoop out the solidified juice (with a plastic spoon) into an air tight container/jar, leave beside a hot cooking pot or by the window in the sun (I usually do that). After a while you will see the clear distinction between the curds and oil. 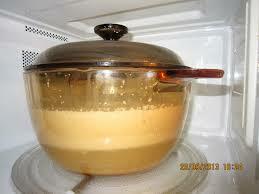 The oil settles beneath leaving the curds on top, scoop out the curds with your plastic spoon. There you have it, your coconut oil in pure virgin form sans heat. The boiling method is basically the same, only difference is, when you have squeezed out the milk from the shaft, all that is left to do is pour the juice into a pot and boil at medium temperature, stirring constantly until it evaporates leaving only the curd, which you then need to pay attention to, cos as it dries on the fire the oil comes out… always leave to cool before pouring into a storage container. Tops 5 ways to get the best out of your Coconut oil. It could be used to cleanse our mouth first thing in the morning and last before bedtime, a process known as OIL PULLING, which helps to eliminate bacteria and strengthen gums and teeth. ( just take a teaspoon each time and gaggle for 30 minutes). It is highly recommended for Oil cleansing as well, which is another process of removing excess facial oil, and cleansing it from inside out, leaving for a clearer and even tone, and also as a facial scrub ( mixed with honey). Coconut oil could also be used for prepping out hair for wash day, a term known as PREPOOING in the natural hair world. 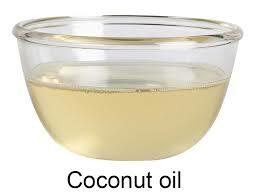 It could also be used separately or mixed with other oils as oil treatment or a deep conditioner. Whip some coconut oil with Shea butter and use as lotion every day for a clear skin, or use as Deodorant if you are looking to avoid chemicals. Coconut oil is still being used by indigenous people in many areas of the world especially Asia, and has helped a lot of women folks care for their hair and even earn a living. Click on the link below to see how it’s made locally in Asia using the boiling method! Till next time hairess…I hope you find the courage to try making your own virgin coconut oil, do let me know how it goes if you do. Cha cha! Glad to be Back ! Thinking of becoming a natural hair diva? isleofazure on Glad to be Back ! Lolo on Glad to be Back !